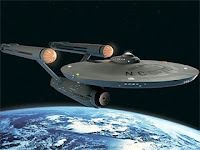 Paramount has released the first photo of the new USS Enterprise (NCC-1701) from JJ Abrams‘ Star Trek. Entertainment Weekly has the first look, and for the most part, the new Enterprise doesn’t look that much different from the old Enterprise. Makes sense to me, and I think it actually looks pretty cool. But why did Abrams decide to make the inside of the ship look like the Genius Bar at an Apple Store? We’ve included a photo of the old enterprise design below for comparison purposes.